Belinda Sillars's limited edition bronze of Casanova Kip is among the art on offer June 4 at the Hound Welfare Fund benefit auction. Photo by Dave Traxler. 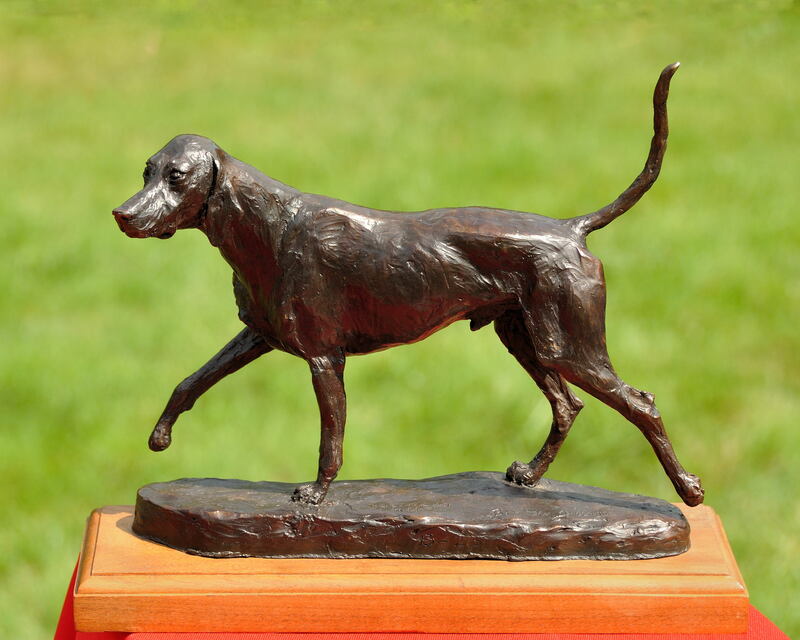 FRIEND of the Iroquois Hunt hounds and renowned bronze sculptor Belinda Sillars has kindly agreed to donate one of her limited-edition bronzes to this year’s Hound Welfare Fund benefit dinner and auction on June 4 at the Grimes Mill in Lexington, Ky. The 12″ by 9″ work (above) is No. 13 of 25. 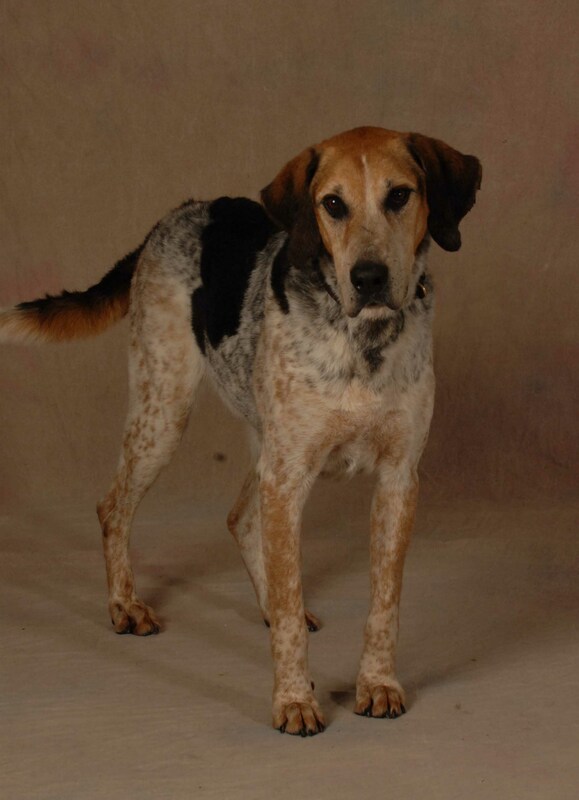 Thank you, Belinda, or your generosity to the retired hounds! This is the latest in a string of great art that will be available for bidding at the auction, which also will feature the unveiling and sale of a new charcoal and white pastel drawing by famed sporting artist Andre Pater. 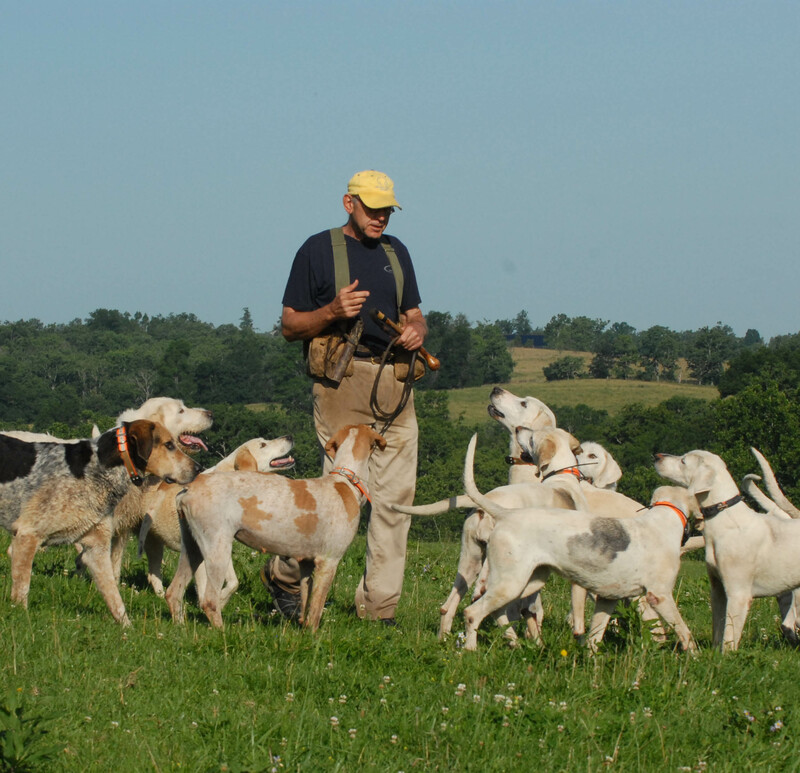 Pater, a member of the Iroquois Hunt, has spoken eloquently about the hunt’s hounds and the Hound Welfare Fund that provides for these generous canine athletes when their working years are over. The auction also will include works by such sporting artists as Sandra Oppegard, Hazel Morgan, Sally Moren, Ena Lund, Judy Boyt, and others. Art isn’t the only thing up for bid at the auction! To see information on more items, click here and here for a sampling of this year’s art and other items. To learn more about how to bid on items even if you’re not able to attend the event, e-mail coakford@aaa-alliedgroup.com. And remember: the Hound Welfare Fund is a 501(c)(3) charity. All donations go directly to the care of our retired hounds! What’s so special about hounds? WE asked famed sporting artist and Iroquois Hunt member Andre Pater that question and got a great, thoughtful answer, which you can hear on the video above (click play, then click the HD box in the upper right-hand corner of the video to see the high-definition version). 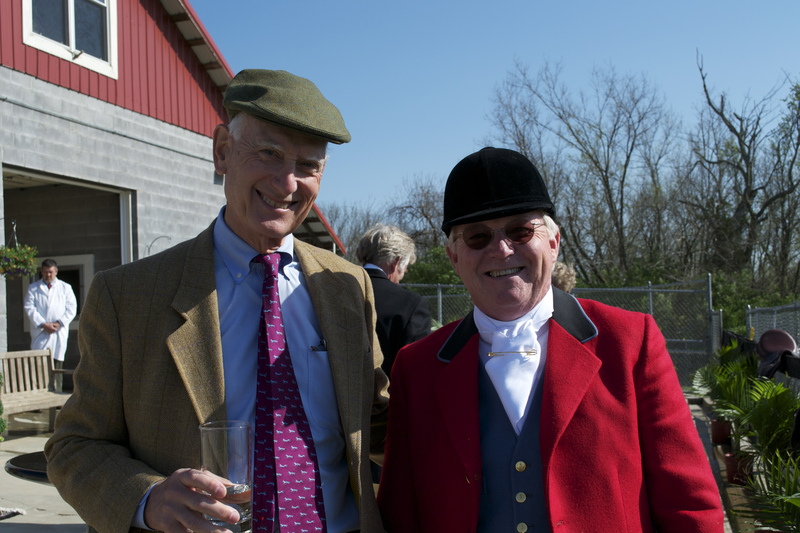 He also offered his thoughts on retiring hunting hounds, and his timing was excellent: the annual Hound Welfare Fund benefit dinner and auction, which supports the Iroquois Hunt’s retired hounds, is right around the corner on June 4. And this year’s live auction will feature Andre Pater’s “Awake,” a charcoal and white pastel drawing of a foxhound. Other well-known British and American artists whose works are coming in for the auction include Sandra Oppegard, Hazel Morgan, Sally Moren, Ena Lund, Judy Boyt, and others! 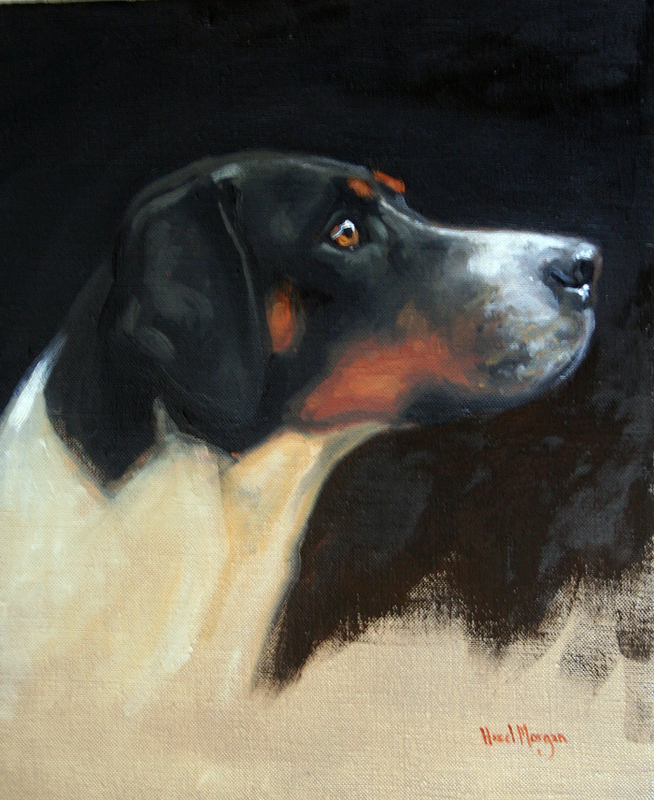 This Wilton Hunt hound study in oil by English artist Hazel Morgan is among the Hound Welfare Fund's auction items this year. The auction offers more than art, too. 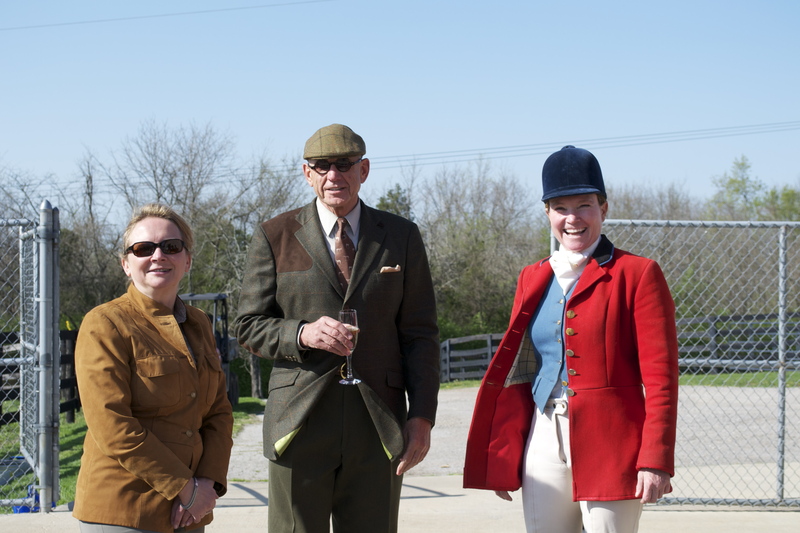 The live auction will feature a sporting clay shoot and picnic at Miller Trust Farm, traditionally one of the night’s hottest items, and the much-coveted chance to have a private hunt with the Iroquois for up to eight people. 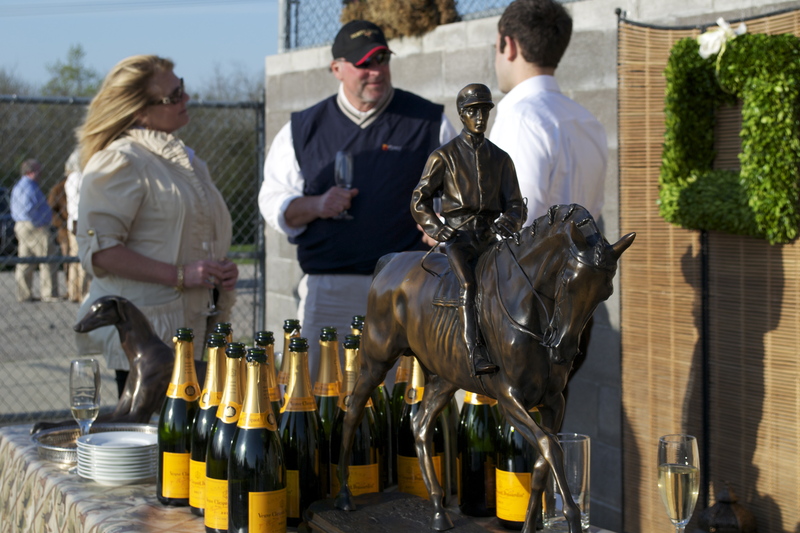 Other items in the live or silent auctions include a morel mushroom hunt and gourmet picnic for two at one of the hunt country’s most beautiful fixtures, Boone Valley Farm; an antique set of stirrup cups with the Iroquois Hunt logo; a unique set of hand-painted glassware depicting hunt scenes; the ever popular tickets to HWF Retiree of the Year Stammer‘s exclusive retirement party; hassle-free Blessing Day braiding and boarding for your horse–and more! 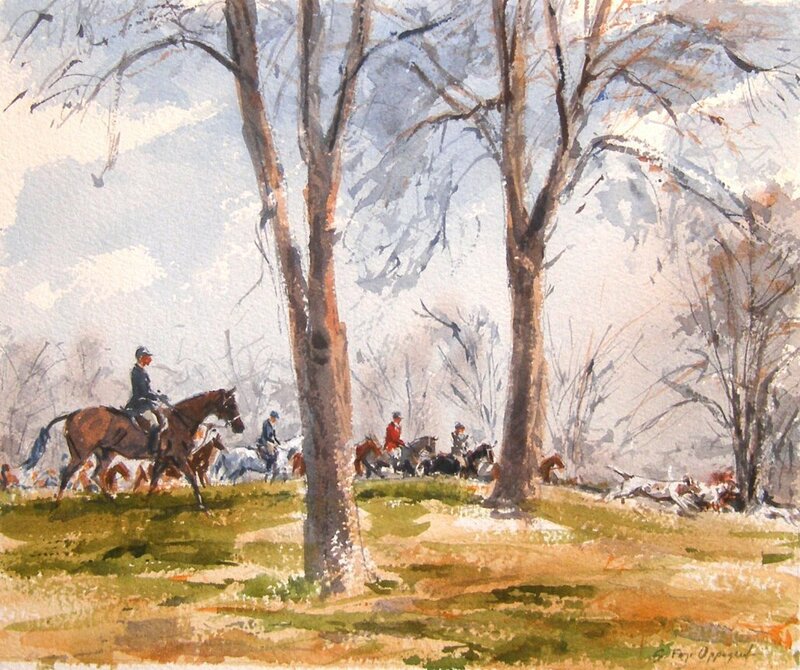 This watercolor hunt scene by Sandra Oppegard also will be among the offerings at the Hound Welfare Fund's June 4 fundraising dinner and auction. 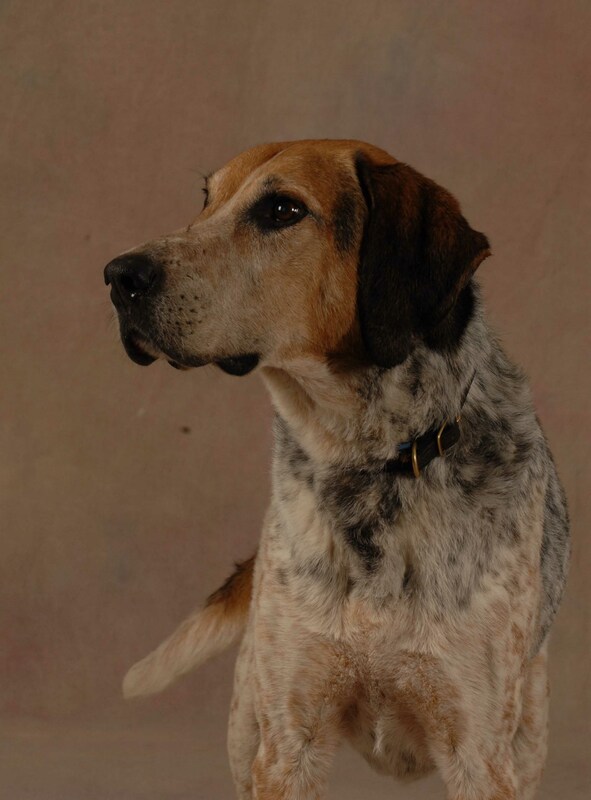 The Hound Welfare Fund is a 501(c)(3) charity that is the first of its kind to care for working foxhounds during their retirement. 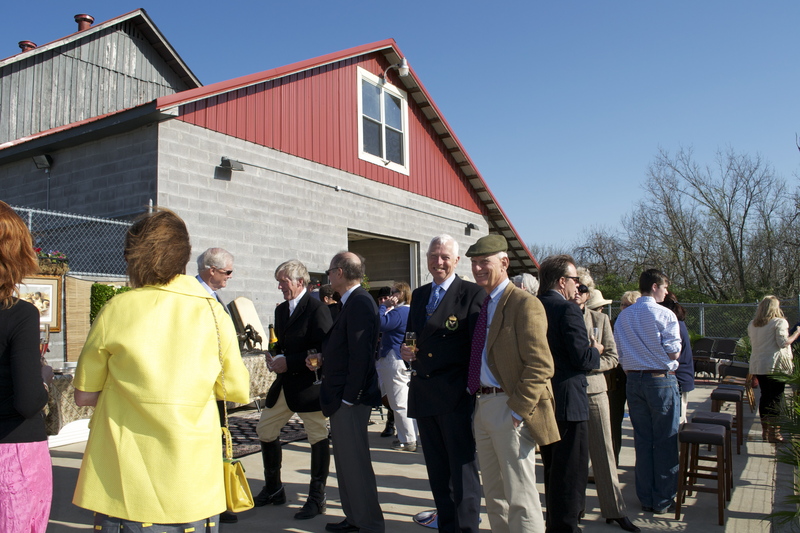 Before June 4’s dinner and auction at the Iroquois headquarters, the old Grimes Mill, the hounds have business to attend to in Virginia. 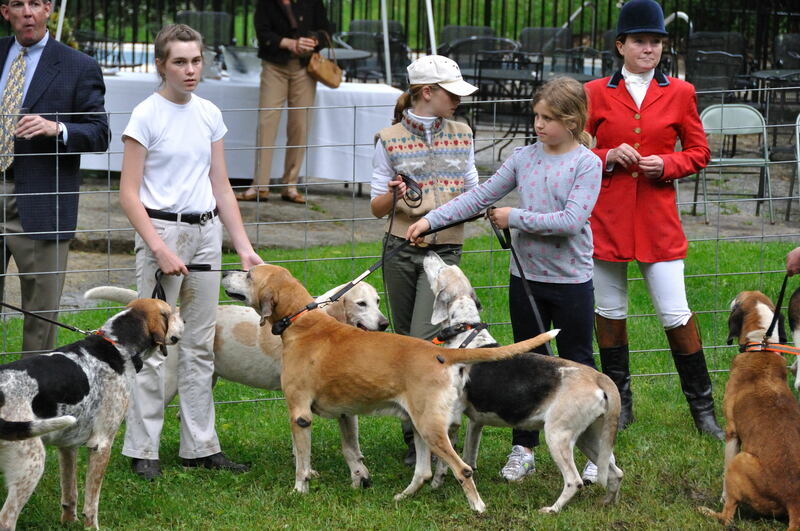 The Virginia Hound Show takes place this Sunday, May 30, at Morven Park near Leesburg, and the houndbloggers will be there to cheer them on. 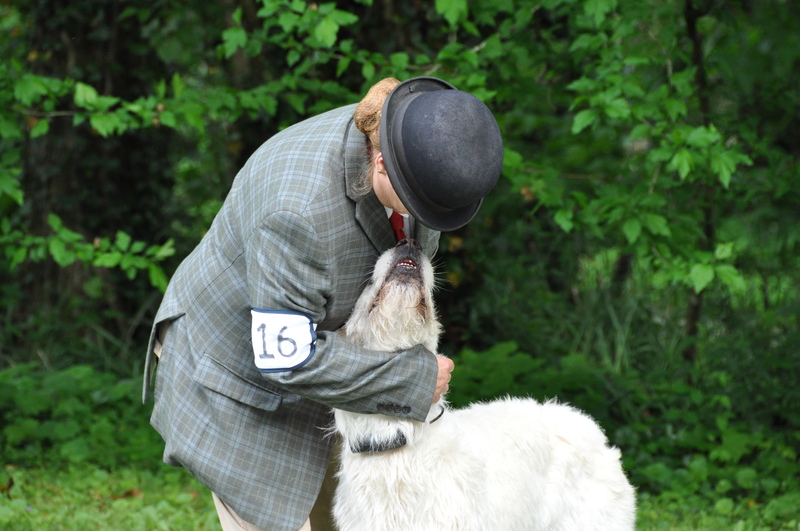 Last year, our Hailstone won his class, single crossbred dog–entered. Stammer '01 went from detention to stardom at Iroquois--and helped huntsman Lilla Mason learn how to trust hounds' judgment. Photo by Peggy Maness. 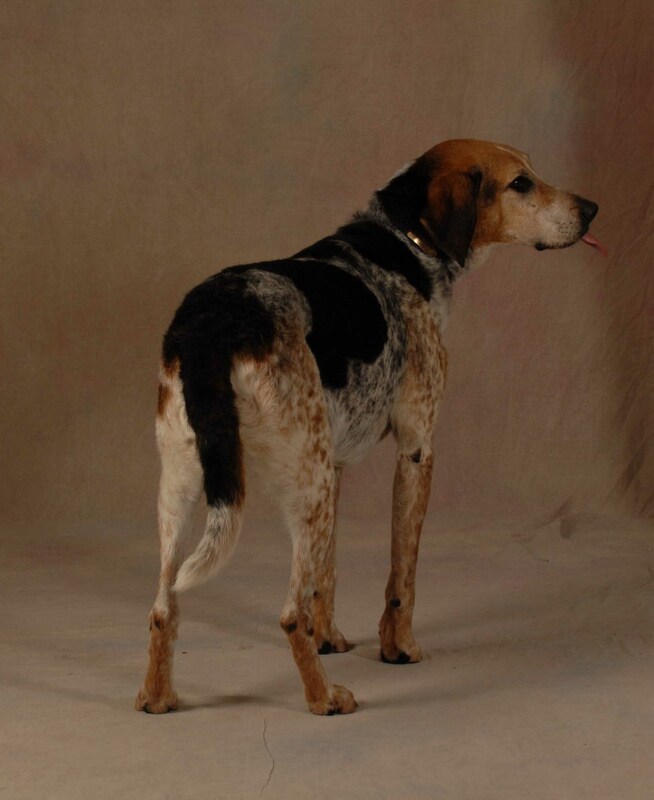 STAMMER is one of those hounds who could go on an inspirational tour, visiting hound high-schools and telling young dogs how important maturity is. 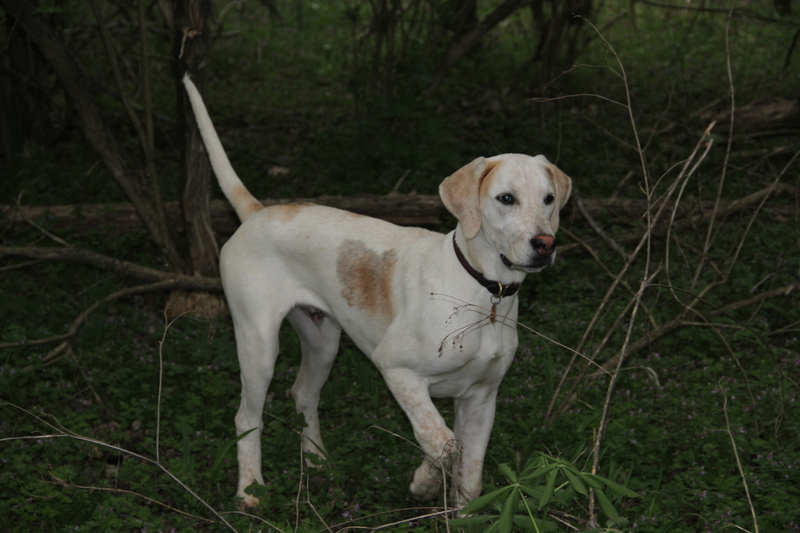 The Hound Welfare Fund‘s 2011 Retiree of the Year came to Kentucky from England as a puppy and began his hunting career with Iroquois. He was so wayward when he first joined the working pack that Iroquois joint-Master Jerry Miller sent him straight back to the kennel for a long while. When he came out hunting again, Stammer developed into one of the pack’s most valuable members and taught huntsman Lilla Mason an important lesson about trusting one’s hounds. The resulting litter by Eskdale and Ennderdale Woodman ’96 out of Cottesmore Family ’98 was large and contained an element you don’t see often in the Iroquois pack: fell blood. 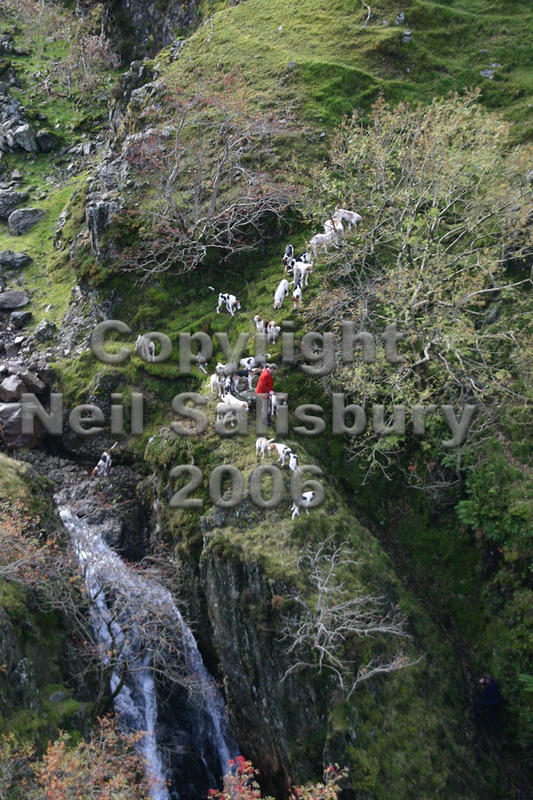 The Eskdale and Ennderdale have worked over the fells in the vicinity of England’s western Lake District since 1857. 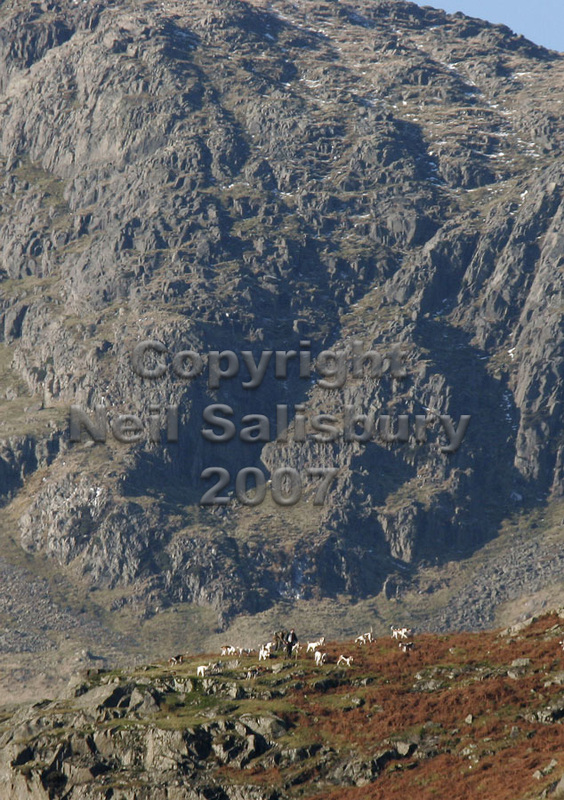 For those unfamiliar with the term fell in its topographical sense, the word is defined as “a hill or other area of high land, especially in northwest England.” That makes fells sound a good bit more innocent and gentle than they really are if you’ve ever tried to follow hounds up and down them. Especially up. 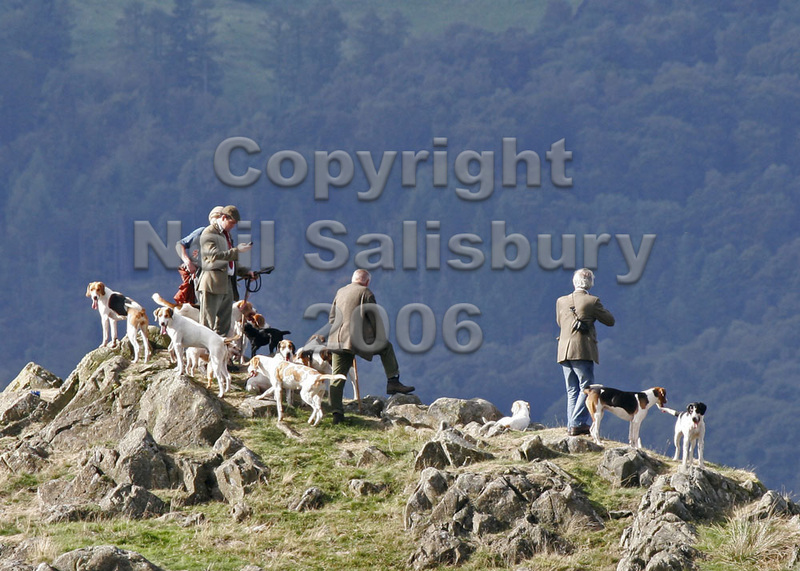 To see what we mean, click here, here, here, and here for several spectacular views of hunting on the fells, whose steep and rocky terrain is gorgeous but also very demanding, requiring huntsman and followers take to their own feet and leave the horses at home. 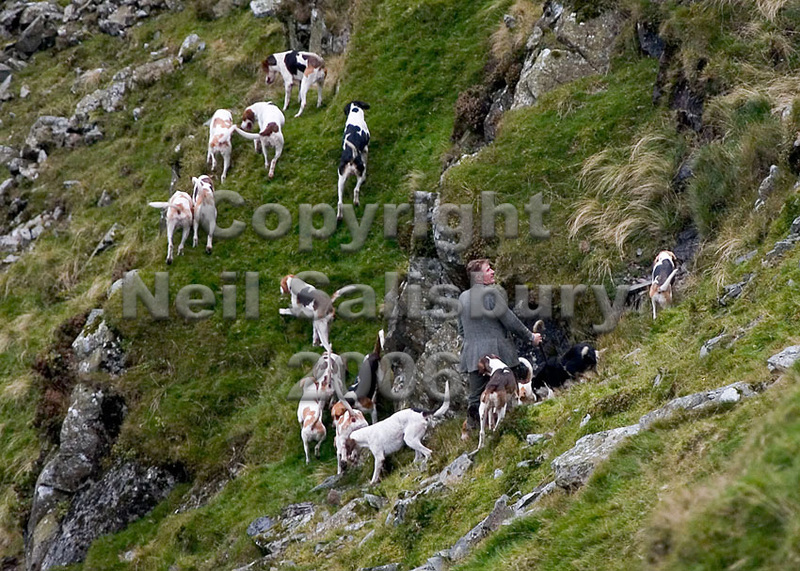 With hunt staff on foot, fell hounds must necessarily be more independent about their jobs than hounds that are accompanied by mounted staff over open grasslands. And though Stammer isn’t all fell hound, that independent streak was still pretty strong in him when he was young, recalled Lilla. About four months out of the working pack gave Stammer some extra time to grow up and think things over. When he was invited to join the pack again for a few hunts before the end of the season, he showed better potential. “And the next year, and for his next five seasons, he was really a top hound,” said Lilla. 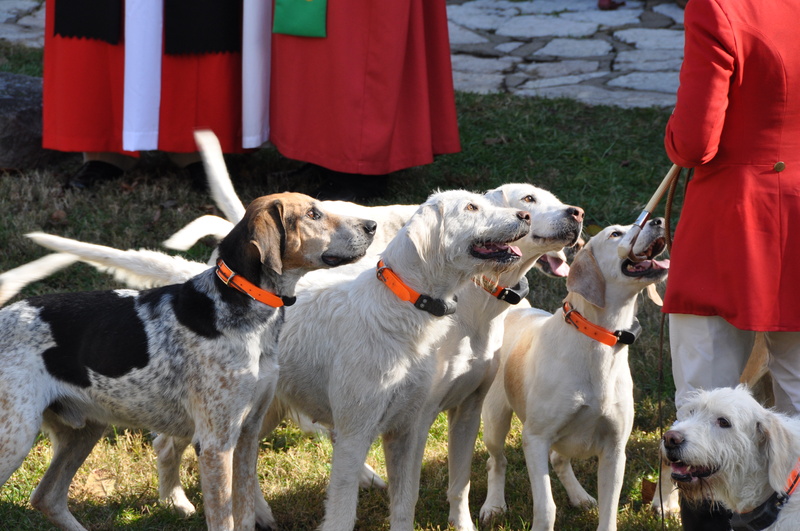 Stammer at the Blessing of the Hounds last November. “He taught me how to trust a hound, because he was independent, so he was a little bit of a different duck from everybody else. I remember sometimes, leaving a meet on what I thought possibly would be a poor scenting day, he’d start going through coverts very quickly. The rest of the pack would honor him and go with him. It was really annoying to me, because I thought, ‘Gee whiz, the hounds aren’t settling, they don’t have their noses down, we’re going to blow through all the coverts in this fixture and then where are we going to be?’ But every single time he found a coyote. “That hound had coyote-sense. He just knew where they were. It might be two or three miles from us, but he knew where it was. And I know he was winding it the whole time he went, and he was in a hurry to get to it. That’s why he would blow through coverts. I finally realized that was just his behavior. He didn’t do it every time–sometimes he didn’t scent something like that and would draw coverts well–but when he was on a mission like that, the rest of the pack always honored him and trusted him. And I learned to sit back and be patient, because he always found a coyote. I knew when Stammer was behaving that way, just go with him. Stammer (far left) on summer walk with Iroquois joint-MFH Jerry Miller in 2009. 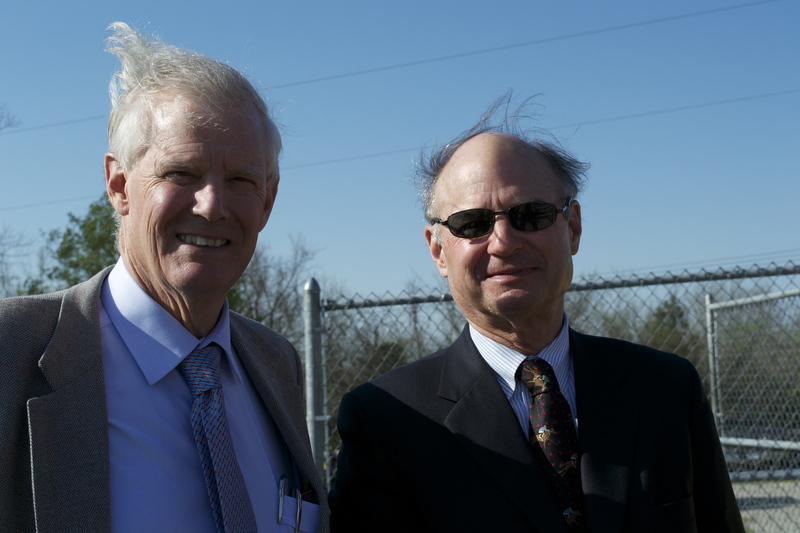 Photo by Peggy Maness. “I don’t think we ever had a blank day when he was out. We might not have found a coyote for two hours, but he knew where it was and we were going to catch up to it. These days, Stammer is enjoying life as a senior gentleman with the other retirees at the hunt kennels. 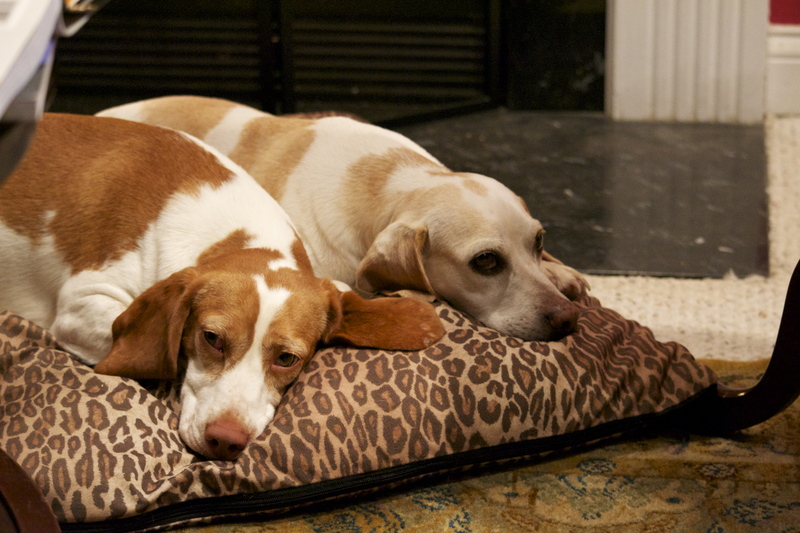 “Hounds show you in different ways when it’s time for them to retire,” Lilla said. “In Stammer’s case, he became independent. “He would leave the pack and go hunting on his own. That sometimes happens, and once an older hounds gets independent, we have to retire him because it can ruin the other hounds. Stammer will be honored at this year’s Hound Welfare Fund Retiree of the Year Reception, which HWF supporter Uschi Graham will host at her home on Friday evening, November 4, the night before the Iroquois Hunt’s Blessing of the Hounds. 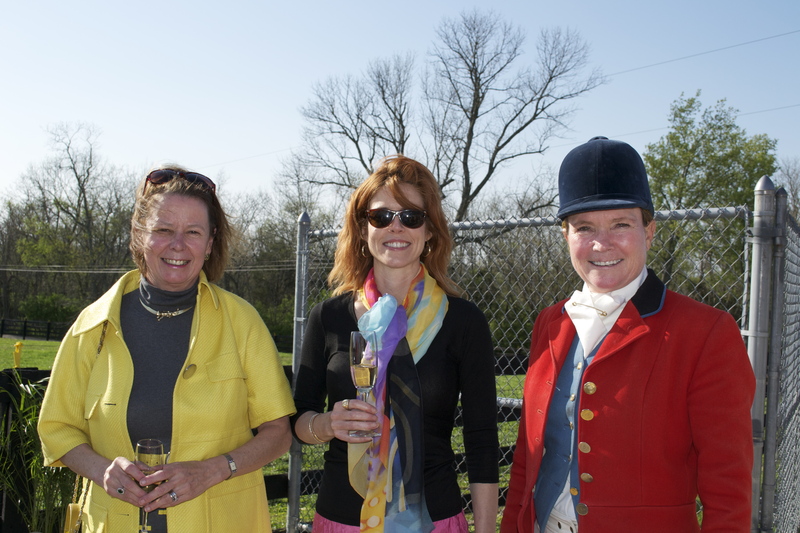 Tickets to the cocktail party will be up for auction on June 4 at the Hound Welfare Fund’s dinner and live/silent auction on June 4 at the Iroquois Hunt Club. For more information about the dinner and auction, please contact us before May 27 at beagle52[at]aol.com. Iroquois Hunt will host its first puppy show on Saturday at the hunt’s headquarters, the Grimes Mill, seen in the video above. The six-month-old HA puppies and the young entered hounds, including the beloved Paper and Driver, have been hard at work practicing for the big day–and so have the Iroquois members who have volunteered to be on the human end of the leash! To see what they’ve all been doing and hear Iroquois huntsman Lilla Mason’s comments on the hounds’ progress and on the purpose of the puppy show, click on the video. To see the video in high-definition, after you click the “play” triangle, look for the box in the upper-right corner that says HD. Click it! Our puppy show will have a different twist on it from the traditional ones in England, which you can see in this Horse & Country TV video from the Berkeley Hunt’s puppy show. The most significant difference is that our attendees on Saturday, including children, will have a chance to try their hand at hound-showing, too! And kids also can enjoy supervised playtime in a pen with the HA puppies, now about six months old. There also will be snacks for kids. 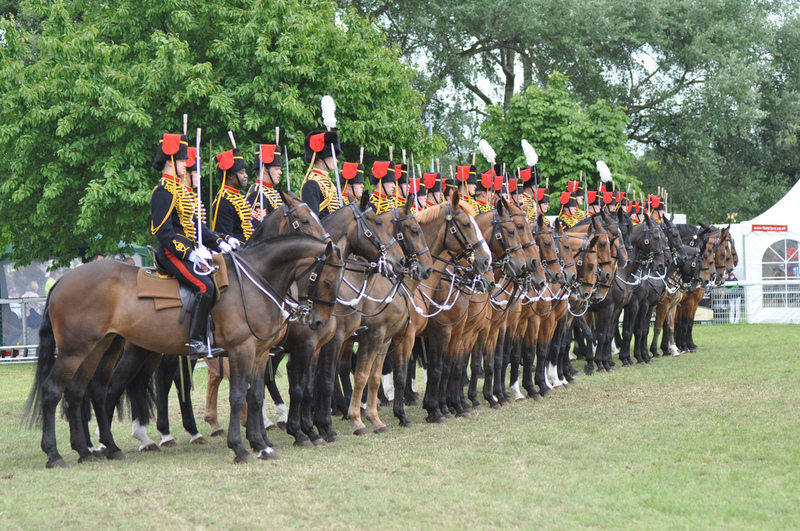 For the adults, there will be the traditional puppy show Pimm’s, as well as hors d’oeuvres. Bud Murphy kindly has agreed to be our judge for the day. The HA puppies will be shown for the first time on Saturday, but the now-entered BA litter will be using this as a dress rehearsal in their training for the prestigious Virginia Hound Show at the end of the month. You can see how they and other Iroquois hounds did last year at Virginia, and get a feel for this beautiful hound show, here. 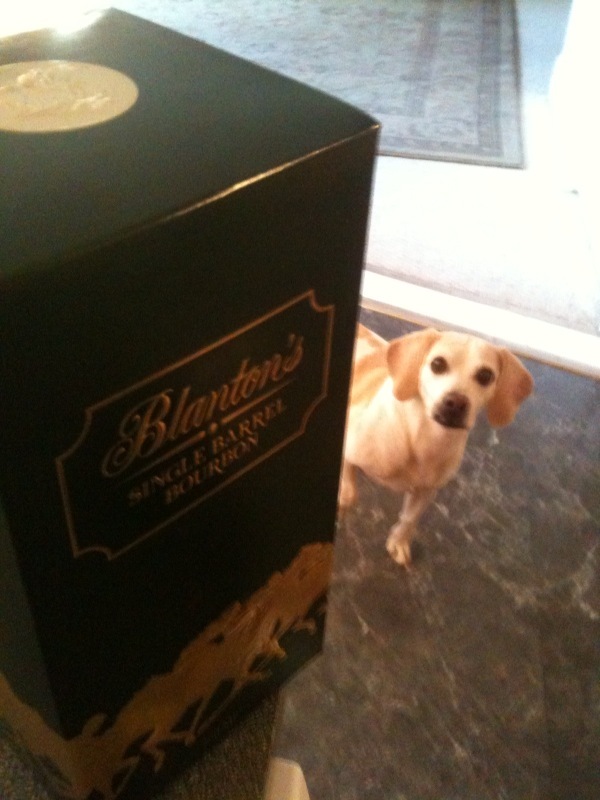 The houndbloggers will be at the Mill Saturday to catch some video, and later this month we’ll see you in Virginia! 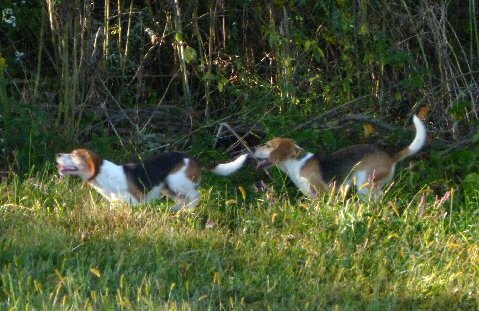 The Clear Creek Beagles, photographed by Jean MacLean. It’s not something American packs have to deal with very often! 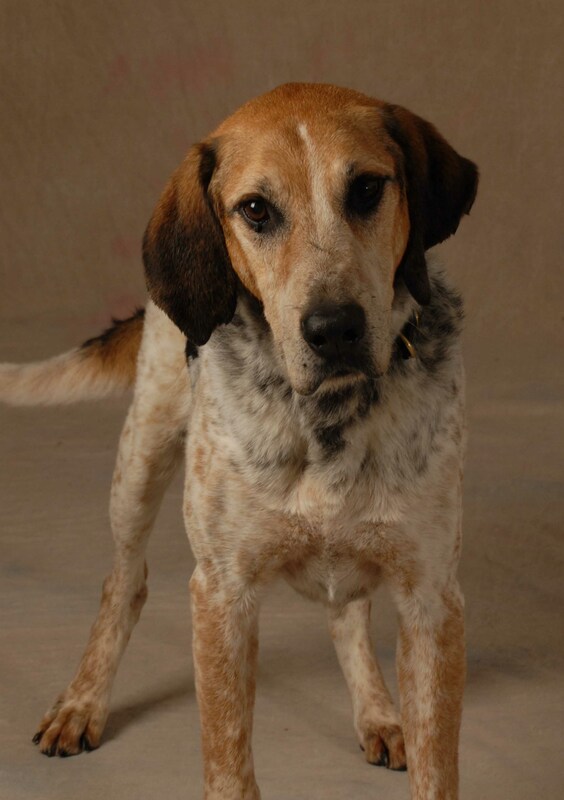 Which makes a nice segue back to the Bluegrass, whereIroquois members, their guests, and the Iroquois Hounds are busy preparing for their first-ever puppy show, to be held May 14 in front of the Grimes Mill. The show starts at 4 p.m. and will feature children’s activities and chances for kids and adults to meet the puppies, retired hounds, and the Iroquois hounds that are being prepared for the prestigious Virginia Hound Show at the end of the month. Also on offer: Pimm’s! Watch this space for more information in the coming days.